Keeping kids safe when they are young is a worry, but as they get older and experience more freedom, the dangers around them increase. Summer safety lessons make children aware of hazards before they are exposed to them. When the long vacation looms, take safety rules seriously. Feel sure you have done the best you can to prepare children to be safe. There are many traps waiting for kids in the summer. By the time they are between nine and thirteen years of age, kids will be out having fun with friends or home alone while you are at work. These original lesson plans are suitable for teachers at school, youth leaders, or parents who wish to adapt them for one-on-one use. Tick bites can cause Lyme disease through the transmission of Borrelia burgdorferi bacterium. Centers for Disease Control and Prevention (CDC) lists symptoms as fever, headache, tiredness, and a rash. If untreated, Lyme disease may spread to the joints, heart, and nervous system. 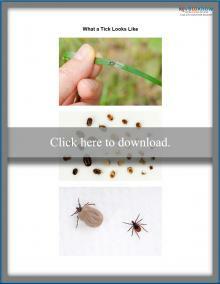 Use this lesson plan to make kids aware of where ticks lurk and how to deal with them. Print the lesson plan, visual handout, and reading comprehension on avoiding tick bites. If you experience difficulty with the download, use this guide for Adobe printables. Download a tick bite lesson plan. 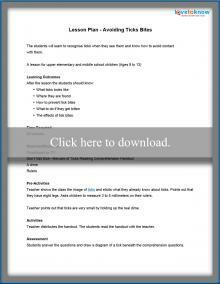 Download the lesson plan worksheet. Download a tick visual aid. According to CDC, there were approximately 3,536 non-boating related fatal unintentional drownings in the USA between 2005 and 2014. One in five were children under fourteen years of age. 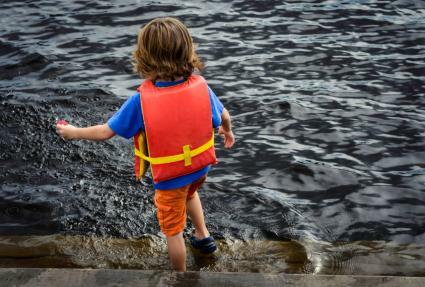 Protect children by teaching them basic rules for playing near or in water. 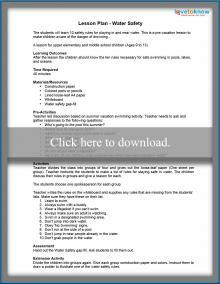 Download the water safety lesson plan. Download the water safety worksheet. During the summer vacation, it is natural for kids to want to be active and shake off the restrictions of daily lessons. American Academy of Family Physicians states if kids' core body temperature rises above 40 degrees Celsius (104 degrees Fahrenheit), heat exhaustion becomes a serious problem and can lead to multi-organ failure and death. Ensure children understand how to play safely on hot days with this lesson about heat exhaustion. 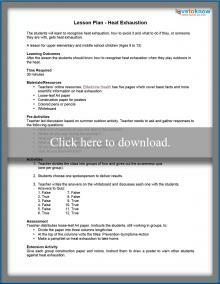 Download a heat exhaustion lesson plan. 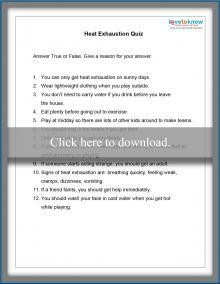 Download the heat exhaustion quiz. You can find other lesson plans on different websites. Safe Internet Surfing supplies information and lessons with activities to make youngsters aware of the dangers of internet surfing, something they are more likely to engage in more frequently during the summer months off from school. Grades 3 to 12 will benefit from the handouts, quizzes, and situations for discussion. Scholastic has a lesson on sun safety suitable for children from grades 3 to 8. With alternative activities for younger and older kids, it teaches how to prevent the dangers of getting too much sun exposure. Learn NC provides several pages of lessons specifically connected to summer activities. The plans cover four days of tuition designed to alert youngsters to hazards they may face while hiking, biking, camping, or engaging in other summer activities. The lessons are complete with supplementary material, and there is a list of related links to other resources. The school year is almost over, and children will have lots of free time on their hands. It's easy to put off giving them safety lessons. Whether in the classroom or at home, be sure to teach basic survival skills to youngsters. It may make all the difference during the summer months.